With so many options to investigate and aggregate information, market research enables us to communicate directly with our target audience and determine exactly what they prefer and why. It’s where we determine the insights to the underlying behaviors of consumers. We’re given a variety of tools, including in-depth interviews (IDIs), focus groups and surveys to collect the data that fuels important marketing strategies. The challenge is that it’s easy to rely on one information source over another because of cost, simplicity or location of the population taking part. In ag, we look at the products we are testing, the way that farmers consume different types of media, awareness of different brands and advertising, and the ease with which they may access rebates, discounts and loyalty awards. 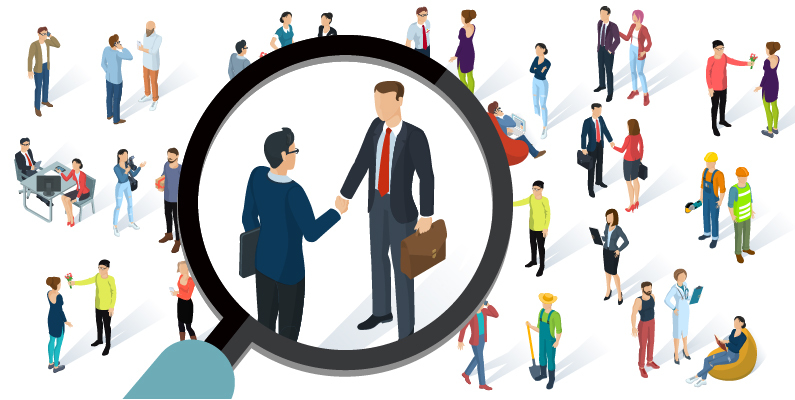 As a result, there is a tendency to seek a very small pool of candidates who fit into a specific criteria and interview them, rather than sample a larger pool and collect objective information through quantitative research. But are IDIs and focus groups always the way to go or the only way to go? 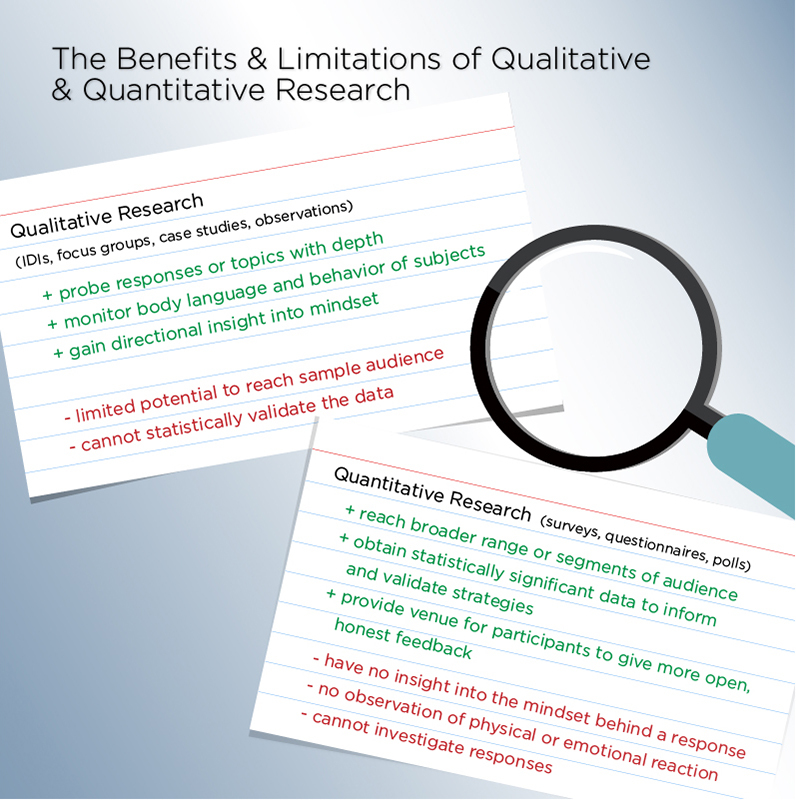 Are we missing the bigger picture and neglecting the additional benefit that quantitative research can provide? With the most trained and qualified staff, focus groups and IDIs offer highly detailed and invaluable sources of information. And not just information – opinions and answers to questions about how consumers purchase and use a variety of ag products and services. This includes why they choose one brand over another, how they feel about different logos, colors, taglines, and of course how the products and services themselves perform in the field. Focus groups and IDIs are also prime opportunities for feedback about customer service and brand loyalty. Why one farmer has used the same brand of tractors in the family for several decades may tell a sentimental story, which informs the brand that it is more than just a tractor. That the brand is part of the family identity and part of the farm. This is a nugget that you can’t drill down from a survey. And then there’s the body language[i]. Whether it’s individual or in a group environment, facial expressions, interpersonal interactions, posture and tone of voice communicate just as much – and sometimes more – in a message than we think it does. 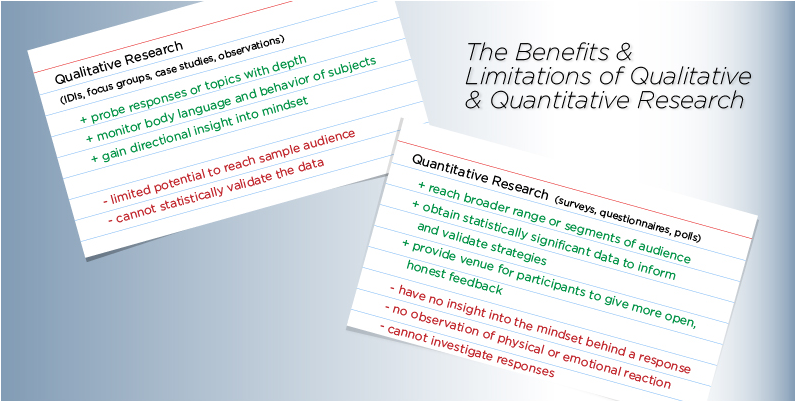 None of this is possible in quantitative research. So why would we toss the IDIs and focus groups? It’s not that simple, and it’s not what we’re suggesting. Call it multidimensional, integrated or dynamic – research. And like marketing, it takes a varied approach. And to understand the highly varied and complex ag audience, it’s best to take this type of approach. Integrated marketing requires integrated research. There is so much to appreciate in IDIs, where we can get these stories of life on the farm and why farmers are attached to products. Similarly, focus groups enable the interaction and conversation between farmers, ranchers and ag dealers, which provides opinions and not always the same opinions, and we are looking for that. We want the differences and to know why. They provide invaluable directional data. To sharpen the context of these groups and varied opinions and to validate the directional learnings, it’s necessary to also use quantitative research, via surveys and questionnaires about demographics, product and service usage and other objective factors. This enables us to test larger populations and obtain controlled, reliable, valid results, so we can make informed decisions and craft strategies based on those results. We might recognize that one group of farmers uses a product regularly in a specific geography and find that the same product doesn’t work as well for another group in a separate part of the country or state. This provides specific variables for us formulate integrated marketing strategies, as much as to develop new products. Quantitative research also assumes that there is a statistical significance to each variable, which you are often unable to assess in IDIs and focus groups[ii]. Though conversations can bring up powerful anecdotes and thoughtful viewpoints, those aren’t necessarily of measurable value to the brand and it’s unsure how they may affect change. Finally, the anonymity of quantitative research provides consumers with an environment to speak with greater confidence and freedom than when surrounded by their peers, brand managers or those with contrasting viewpoints[iii]. This presents the most honest consumer feedback for this very reason. Market research is one of the most substantial gateways to information about our ag audience. Using what we can within our means provides the most optimal picture of our audience and their assessment of our brands, how customers use them and how we can work together to be the most effective.